Lights, camera… action! One of my favorite room accessories of late is the vintage camera. It’s the perfect accent because I love photography and have a strong affinity for all things vintage. Including pieces that reflect your personal interests is a key ingredient when decorating your home. In my case, that ingredient is a classic camera. You can find vintage cameras a variety of places: your local flea market, antique marts, or even your grandparent’s closet. I usually find the best ones at flea markets or a local antique shop called Wertz Brothers. You may be wondering how to include non-traditional decor items, such as a vintage camera, into your living space… It’s simple: give it a chore. Personally, I like to use mine as bookends on my shelves. Another idea is to use one as a paperweight on your desk. If you’re really into photography, this is also a lovely way to present a collection of vintage cameras. Or, you can group it with a few other decorative items as shown in the photo below. 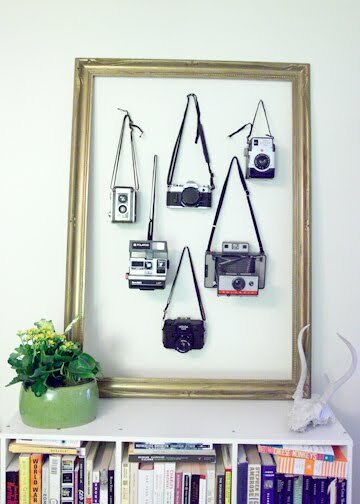 Vintage cameras are generally inexpensive and they’re an easy way to add a little character to an otherwise empty space. Whether it’s an artifact from a recent trip, an instrument or in this case, a vintage camera, mixing unusual items (specific to you) into your home adds a nice personal touch. What unconventional room accessory defines you?